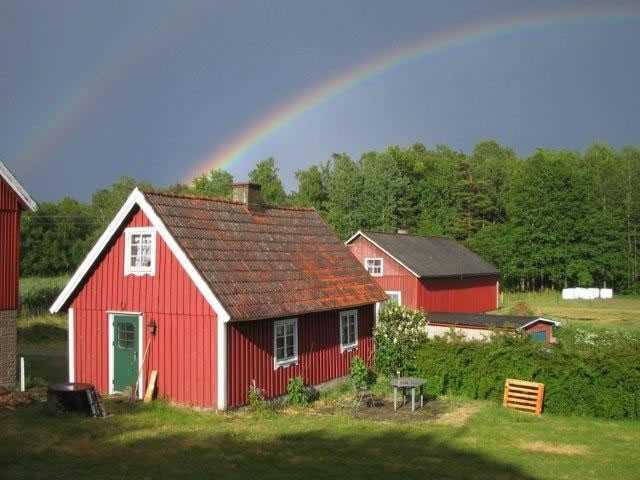 The farm is part of the village of Västra Torup and lies ca. 6 km north of Perstorp, with nature all around. When you rent a cottage from us, you will be coming to a quiet environment with open fields and forest. You can enjoy life in the country on our farm and you are welcome to participate in the work on our farm. There is a rich bird life and if you have som luck you might see wild animals like moose, deer, wild pigs, and foxes. We have 2 cottages to rent - one is large with beds for up to 8 persons and the smaller, cosy cottage has beds for up to 4 persons. The cottages on the farm have views over the pasture land with alpackas, mini shetland ponies, cows and forest. The large cottage: The yellow cottage is fully equipped for 8 persons. 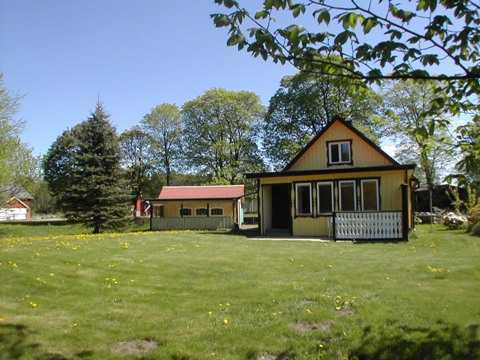 There is a WC/shower, kitchen, living room with wood stove, dining room and 3 bedrooms. There is a garden just outside with furniture, grill and grass. The little cottage - The red cottage is fully equipped for 4 persons with WC/shower, kitchen which is open to the living room, fireplace and pizza oven, and bedroom on the upper level. Just outside there is a garden with furniture and grill. The cottages have a normal standard. The furnishings are simple but comfortable. Dishes and cutlery are mixed. The beds are comfortable. Closet storage space as well as living area is limited. The bedrooms are somewhat small and not always separated by doors. The warm water tank is not large so there might be some waiting if many guests want to shower within a short period of time. To avoid misunderstandings you are encouraged to ask for details when booking. Due to safety reasons you will not be allowed to have more overnight guests than the amount given at the time of booking. Children under the age of 2 are not counted in this number. The equipment and supplies in the house will fit the number of persons booked. Guests are required to clean the house before departure. There will be a cleaning fee if the cottage is not cleaned. The cottages are equipped for light housekeeping/ self-catering. Bedding, towels, toilet paper, dish detergent and such are your own responsibilities. There is a possibility to rent sheets and towels. There are 2 large waste containers with many sections for sorting of all waste. The closest grocery stores are in Perstorp, 6 kilometers from our farm. There are ICA and Netto stores, open every day - as well as other stores. One is required to have a fishing licence in order to fish in most rivers and lakes. The closest lakes are Svenstorp Lake and Bälinge Lake. It is about 10 km to Perstorps beautiful 18-hole golf course. Railway station in Perstorp - 6 kilometer. (with departures to Hässleholm and Helsingborg every hour). Pets are welcome. Dogs must be leashed when they are on the pastures of our animals. The cottages are available from 15.00 on the first day of the booking and departures are at the latest 11.00 on the final day. Arrivals and departures are always on Saturdays, unless otherwise agreed upon.